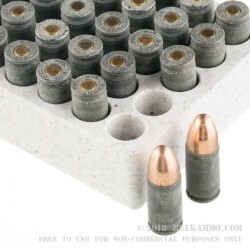 There's not a shooter alive who wouldn't mind cutting their ammo bill. 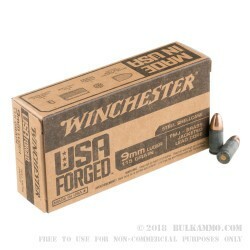 To that end, Winchester has introduced the USA Forged line which utilizes non-reloadable steel cases to help reduce costs and get shooters back out to the range. The steel cases are accompanied by Boxer primers, clean-burning powder, and a unique surface treatment which fights off rust during long bouts of storage. That makes this 500-round bulk case of 9mm Luger ammo appropriate for rainy day storage. 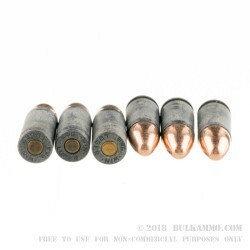 Each round is capped off with a 115-grain FMJ bullet. Winchester is using the exact same quality projectile in this cartridge as in their ever popular Q4172! The lightweight, copper-jacketed projectile possesses a slick curvature to help it feed neatly in 9mm ARs as well as a wide assortment of handguns from Beretta's new APX to Sig's classic P210. Many other ammo choices for competition, plinking, and personal defense share the 115-grain weight profile; that means that this ammo exhibits recoil and travel ballistics that can be related to a wide range of loads from various manufacturers. Winchester has been around for over a century and a half and has helped to develop standards in ammunition followed by many of today's companies. Their longevity and experience give them a powerful platform from which they can offer inexpensive products that perform flawlessly. I'll start off by saying, the casings do seem dirty, however, that hasn't affected their performance in the least. I shot upwards of 450 rounds, fed from cheap ETS mags, through my glock 19 during several IDPA/USPSA matches without a single failure. As for accuracy, I consistently hit the inner 50% of the 8" center circle on IDPA targets. I've never shot quarters at 30 yards with it, but if I wanted match grade accuracy I would have bought match grade ammunition. This is more than accurate enough for any practical purpose. I had numerous failures to fire, failure to extract and several underpowered rounds. They weren't isolated to 1 pistol but 3. A Beretta 92, HK P30 and a Sccy Cpx 2. Also it wasn't very accurate. Q: Hi - is the projectile steel core? 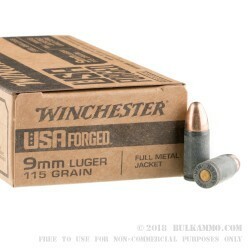 A: Hello Luis, This Winchester ammunition is loaded with a standard lead core, copper jacketed projectile.